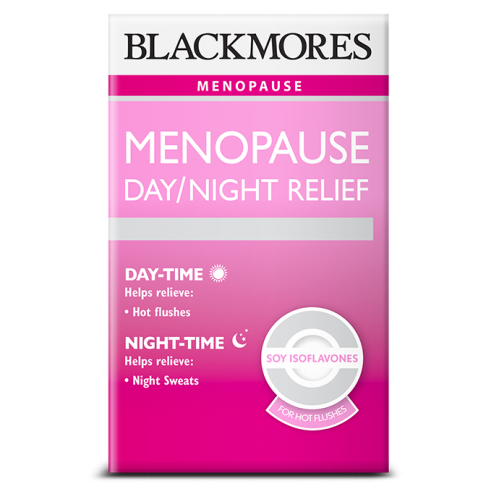 A day/night formula for the relief of menopausal symptoms with a specifically chosen dose of soy isoflavones. It contains a concentrated dose of soy isoflavones to relieve menopausal hot flushes with regular use, with the addition of herbs traditionally used in Ayurvedic and Traditional Chinese Medicine to provide relief of irritability, mild anxiety, difficulty sleeping. The day formula combines concentrated dose of soy isoflavones to reduce menopausal hot flushes with regular use, PLUS Siberian Ginseng – which may help to relieve tiredness, and schisandra –used in Traditional Chinese Medicine to relieve irritability. The night formula also contains soy isoflavones and may help to reduce menopausal night sweats. It also contains withania and zizyphus – traditionally used in Ayurvedic and Traditoinal Chinese Medicine respectively to relieve mild anxiety and difficulty sleeping. Adults- Take 1 x day tablet in the morning with a meal and take 1 x night tablet 30 minutes prior to bedtime.